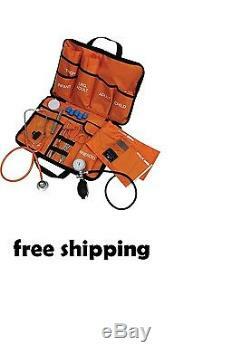 Paramedic First Aid Kit Medical All In One EMT Mabis Medic-Kit Emergency. Designed for the demands of the high stress situations EMTs and Paramedics face on a daily basis. Rugged bright orange case with matching accessories and individual pockets make finding the right tool quick and easy. 5 matching calibrated cuffs with quick release connector: adult, infant, child, large adult and thigh. Ambidextrous chrome-plated palm aneroid gauge. Kit also includes: dual head stethoscope with I.
Tag, Taylor percussion hammer, shears, penlight, 6 latex-free tourniquets and tape measure. Dual head stethoscope with I. Designed for demands of high stress situations. Infant cuff fits an arm circumference of 5.5" to 7.8". Child cuff fits an arm circumference of 7.7" to 11.3". Adult cuff fits an arm circumference of 11" -to 16.4". Large adult fits an arm circumference of 13" to 20". Thigh cuff fits a patient arm circumference of 16.1" to 24.2". The item "Paramedic First Aid Kit Medical All In One EMT Mabis Medic-Kit Emergency" is in sale since Sunday, June 04, 2017. This item is in the category "Business & Industrial\Healthcare, Lab & Life Science\Medical Specialties\Emergency & EMT\EMT Bags & Kits". The seller is "egrdiscountstore" and is located in Miami, Florida. This item can be shipped to United States, Canada, United Kingdom, Denmark, Romania, Slovakia, Bulgaria, Czech republic, Finland, Hungary, Latvia, Lithuania, Malta, Estonia, Australia, Greece, Portugal, Cyprus, Slovenia, Japan, Sweden, South Korea, Indonesia, South africa, Belgium, France, Ireland, Netherlands, Poland, Spain, Italy, Germany, Austria, Israel, New Zealand, Philippines, Singapore, Norway, Saudi arabia, Ukraine, United arab emirates, Qatar, Kuwait, Bahrain, Croatia.